Yesterday, the Government in cooperation with its many friends in the media, the Environmental Protection Agency (EPA) and Irish Water, launched its first major propaganda campaign of 2015 aimed at defeating those who are refusing to pay water charges. The message was simple: The water is poisoned, the infrastructure is about to collapse any minute with dire consequences for ‘customers’. The only thing that will prevent the greatest catastrophe since the famine is – investment, lots and lots of investment. One million homes at significant risk from contaminated drinking water screamed the Irish Independent headline. And just in case readers didn’t get the fear message, there’s apicture of two lovely children brushing their teeth, great to get the emotions going. Other dire warnings included: health risk to babies, e-coli, cryptosporidium, lead poisoning, endless water notices, risk to thousands of jobs. ‘Customers’ were warned that if they wanted a modern water system they would have to pay for it. €500 million per year for ten years – minimum. There are now people in Ireland who cannot drink their water because it will make them ill. His solution: Slap a bill for €2.3 billion on ‘customers’ to pay up or risk getting sick. We want to become an organisation trusted by people to deliver every time they turn on their tap. What he means is, of course – trusted to deliver a bill every time a ‘customer’ turns on a tap? 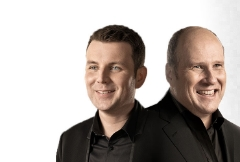 To be fair to Newstalk’s (fully owned by Denis O’Brien) Breakfast presenters, Ivan Yates and Chris Donoghue, they didn’t even bother with balance. They got stuck in right away – 20,000 on boiled water notices, nearly one million at risk. They interviewed a spokesperson from EPA asking him comfortable, leading questions that were very helpful to Irish Water. almost a million people very significant investment needs to take place. RTE also played its part in the Government’s propaganda campaign. Here’s part of the written introduction on the Sean O’Rourke website to an interview with Head of Asset Management at Irish Water Jerry Grant. In the face of opposition to water charges, the response from government and from Irish Water has remained steady. If we want to ensure a sustainable and clean supply of water into the future, charging for water is the way forward. In fairness to RTE, this clear and dramatic abandonment of balance in favour of supporting Government policy is courageous. At least listeners now know where the national broadcaster stands on the question of water tax. On RTE’s Late Debate presenter Cormac O’hEadhra nearly had a heart attack at the sheer horror of what was revealed in the EPA report. Eight parts of Donegal had traces of a potentially harmful substance in their water supplies in 2013, according to the latest report from the Environmental Protection Agency. It has found that the supplies contain excess levels of “trihalomethanes” which occur when naturally-occurring organic and inorganic materials in the water react with disinfectants put into the supplies, like chlorine and chloramine. Some people who drink water containing total trihalomethanes in excess of the acceptable limits over many years could experience liver, kidney, or central nervous system problems and an increased risk of cancer. Directives to take action were issued in 2011 but by the end of 2013 only Ballyshannon PWS had complied. But last year the EPA initiated prosecutions in relation to the Letterkenny Public Water Supply. The comprehensive report, a copy of which has been seen by Donegal Now, also highlights how many private wells are at risk from contamination. The report also shows that there are 33 areas in Donegal where water supplies require remedial action. Funny, all this hysteria, because Irish citizens (as opposed to customers) have been aware for decades that the water system is Third World standard, at best. They know they’re being poisoned, they know political incompetence and corruption is at the root of the problem, they know major investment is required. They also know, and this is where they depart from the position of the Government and its friends in the media, that this time they are not going to be screwed because of the greed and corruption of politicians.